Hey it has been a while! 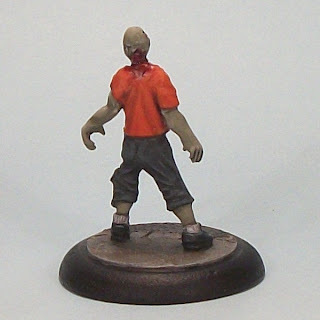 ; another Zombie and it isn't even Zomtober (and no doubt there will be another Zomtober! 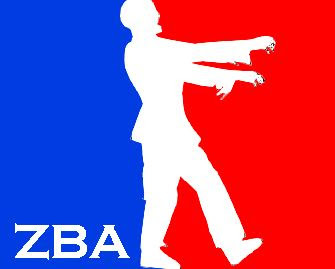 Maybe I could make a suitable logo for Zomtober 2013? But I digress...). Anyhow, I have recently been painting quite a bit of Anima Tactics (as can be seen on my Anima Tactics blog here) and a bit of stuff for Pulp City like my Hadrons (which can be seen here on my Pulp City blog), and I thought I needed to do something else. Time for a zed then. 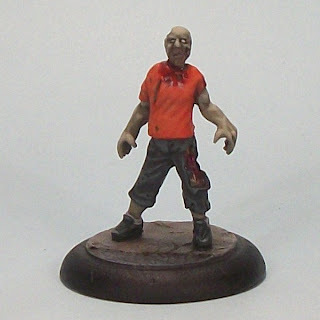 Well I tackled one and found I am a bit rusty at painting my Zombie flesh recipe; I also tried a different wash (Army Painter Soft Tone; back to Devlan Mud for as long as my stash lasts...), and I was trying out my new Lava Orange from Army Painter. A great base orange, but I need to work out how to work with it, both shading/washing and highlighting. In the mean-time it is another Zombie done, and will have two more with the orange colour theme to continue my Zombie threesomes. Oo-er - that sounds worse than I meant it to! The mini is from Hasslefree, but not sculpted by Kev White as far as I know - not sure who the sculptor is. I prefer the Studio Minis ones generally speaking, but if I ever paint all my Zeds, at least they should be varied! This was kindly crafted by TWT (his blog is here), who bundled it with some other stuff for me. I painted it to approximately match the big heads I got from my aquarium shop. Basically greys dry-brushed with a mix of washes in brown, green and grey. I can see this (and maybe others, hint, hint!) as a warning totem in a remote jungle, perhaps on Resurrection Island. The mini was from What The? 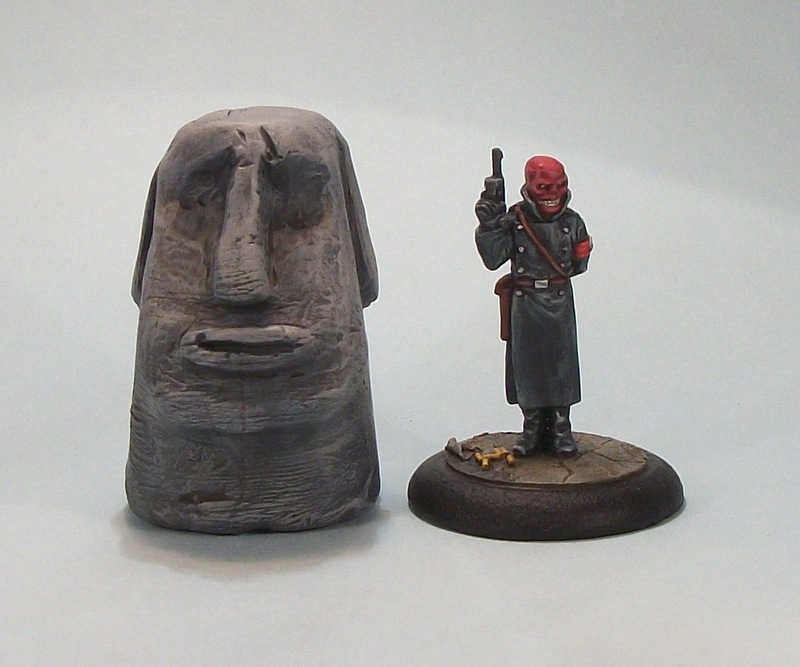 and is used for scale (with 30mm base). Thanks a lot TWT - very much appreciated! I recently bought some kits from Plat Craft, a Spanish company that is producing gaming-terrain kits using foamed PVC (makes a change from MDF!). These are the first things I bought and I thought I would briefly outline my initial impressions, with more insights when they are eventually built. 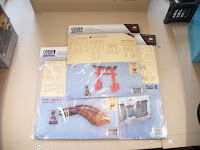 The kits I picked up were: (2 x) Torii Gate; Fukei Bridge 2; Sci-fi big container. It was the Torii gate that led me to Plast Craft as a manufacturer. Cheap as chips. I think these are a bargain price as long as you understand what you are getting (see Downsides). Simple construction; they all have instructions which are clear. Quick turnaround of order by Plast Craft. Lack of surface detail; foamed PVC is not a straight alternative to MDF, so the shapes are plain (possibly die-cut?) and will need work by the modeler to add any sense of texture. 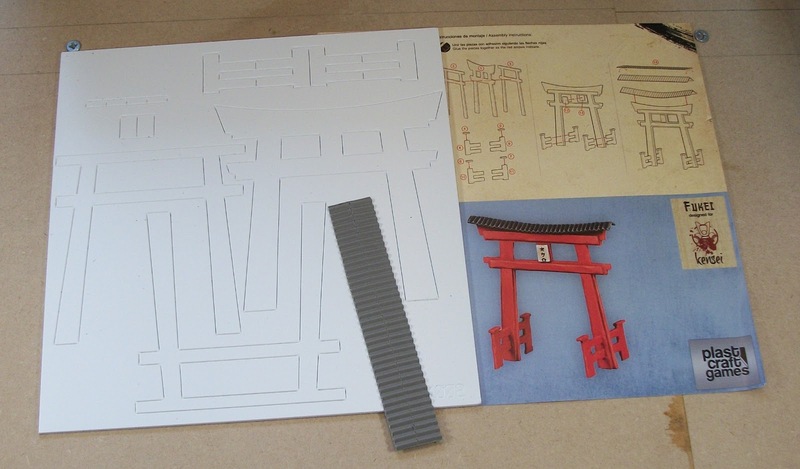 Photographs of the finished and painted pieces can therefore be misleading - especially the planking grain on the Fukei Bridge which does not exist on the product as manufactured. So what I would suggest is judicious consideration of the products available, and asking yourself that if a lot of extra work is required to add texture (for example the need to create the effect of planking on the Fukei Bridge), then how cost-effective is it really since other options may be as cheap or cheaper (e.g. scratch build), with the time factor being a big issue in decision-making. Before building some of these, I would suggest that some represent excellent value for money, but anything that appears to have a lot of texture would probably necessitate a lot of work so buy with caution. Not my idea, but I wish I had done this so much sooner. 1. That the hype about retaining paint fluidity would not be met. 2. It would be a hassle to use. Well I was wrong, very wrong, and as I say, I wish I had made this sooner. Already after a few days I have noticed that acrylic paints used from the wet palette retain fluidity longer, allowing for smoother application, and more leeway in time to use up the decanted paint. In the second picture, the photograph shows the wet palette as used this morning and four days ago. The yellow and orange that still look glossy are from four days ago; they are not usable now, but retained some fluidity for around 24 hours. The red-brown flesh wash (just above the two browns at bottom left of the paints area) and the two browns below it are all two hours old at the time of the picture, and all still have fluidity. The wet palette cost me £2.99 in dedicated materials, but all of them could be found around the typical house. I used half a cellulose sponge which was made wet, wrung out, made wet again and wrung out to retain dampness. Then I put a strip of grease-proof paper over that (wrapping the ends under the sponge) and the container is one of those lockable lid types. Simple, and that £2.99 included 2 containers, 6 sponges and a few metres of grease-proof paper. This should last a while. I am sure none of us has missed the surge in crowd-funded new minis games and lines in the past year or two, and it looks to me that even if the approach to such campaigns will see some change, it is here to stay as a business model. However, crowd-funding is no guarantee of success and some campaigns have failed for whatever reasons. That said, there is a campaign I want to highlight that is close to funding, and I would love to see it make its goals and more. Heroic scale, Survival Horror Miniatures game where Fear, brutality and dead bodies are the key to winning. The game is honest about its subject matter and that means I am fine with the content as advertised, but just trying to give fair warning that concepts may not be for the squeamish or for those that do not like to mix those kinds of concepts into their gaming. So if that sounds of interest, maybe give this Kickstarter a look.